Imaging of the spine is given a thorough update in this issue, beginning with an article on spine segmentation, enumeration and normal variants. Imaging of degenerative disease of the spine is then reviewed, giving consideration to appropriate utilization of imaging, specificity and sensitivity shortcomings in evaluation of degenerative disease, risks and benefits of imaging of degenerative disease, and the prevalence of radicular and xial pain and underlying pain generators. Next, the validity and socioeconomic impact of spine imaging in evaluating “degenerative” pain syndromes is reviewed. 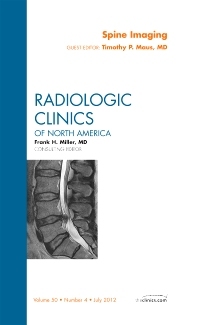 Pathophysiology and biomechanics of disc and posterior element of degenerative disease is reviewed, along with imaging of radiculopathy / radiculitis, imaging of central canal stenosis, and imaging of discogenic pain (using MRI and discography). Imaging of joint related axial pain, spine neoplasm, spine infection, and non-acute trauma is also covered.